It has been two years since the first trip to a very remote area, I still have quite a clear picture in my head of that place. However, to put that picture into a picturesque description could be a challenge, somehow I dreaded the idea of putting them into words. I have been thinking of writing this material, and it took me quite a while on how I wanted to present it to you. 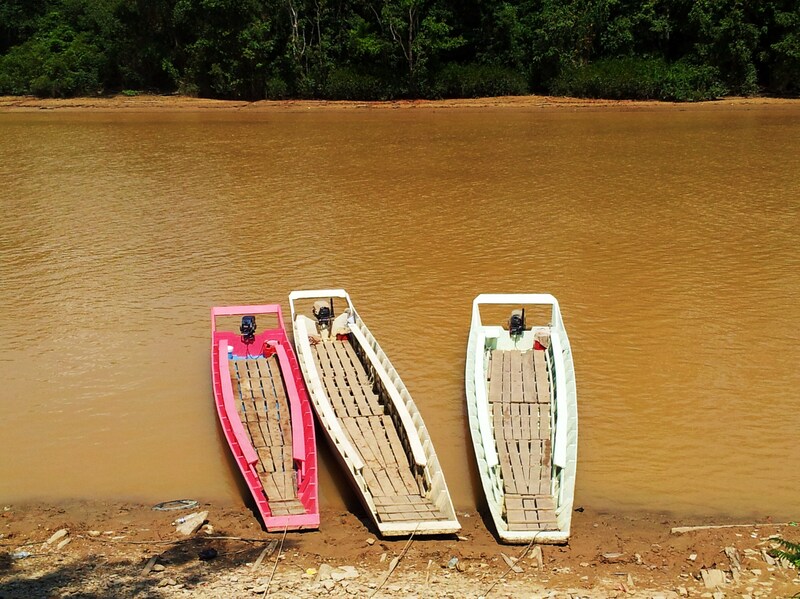 Deep in the interior of Sarawak, people are still depending on the nature to give them food on the table. River is their only mode of transportation. It is part of their lives, their assets to make a living. I believe it is a good representation of a simple life. Certainly, life at the remote area is hard, but at the end of the day, they show appreciations for their life and hard work and celebrate life it is. When I think of a simple life, my thought is on those people living by the river. People who lived in a place, totally cut off from the outside world. Their only communication is through satellite phone. With the development as an important subject for the country, this perspective of documentation is not a popular topic. Newspapers focus more on their hardships, their struggle to make ends meet, and their plight to fight rural poverty. This issue receives special attention nowadays, especially with higher living cost. These rural folks actually pay more for groceries or household items than the city folks. “Transportation cost is high”. they said. “We have to pay extra fee”. That is why, most folks would rather travel once a month to the town to buy the things they wanted. Without a doubt, basic facilities such as clean water and electricity supply are needed to make life easier. They deserved what the city folks have. But let’s put aside all that problems for a while, and look at the aspect as suggested from the topic – a simple life. Life by the river is like the river itself. Simple life it is. Growing up in the urban area, I am a stranger to this new world. My first trip to a very remote area was in 2010. I was with a group of NGO for nation building programme in Punan Bah. It took about eight hours boat ride from where I live. I remember that ride very well. We got to the wharf before 6am and the boat was freezing cold. I suspect the air-conditioner is not adjustable. There was a toilet at one corner, it was a very small room and smelly of course. Once in while, passengers would enter the toilet and when that door opened, the smell filled the room. It didn’t just smells, it was suffocating. It was a relief to have reach Punan Bah in the afternoon. We were hungry, tired, and sore. But the whole trip isn’t the point. The point is…when we arrived there, we were about to embark into an unforgettable experience. The people were friendly, we were greeted and treated like Presidents, Prime Ministers..very important people. 3-day 2-night trip was memorable. 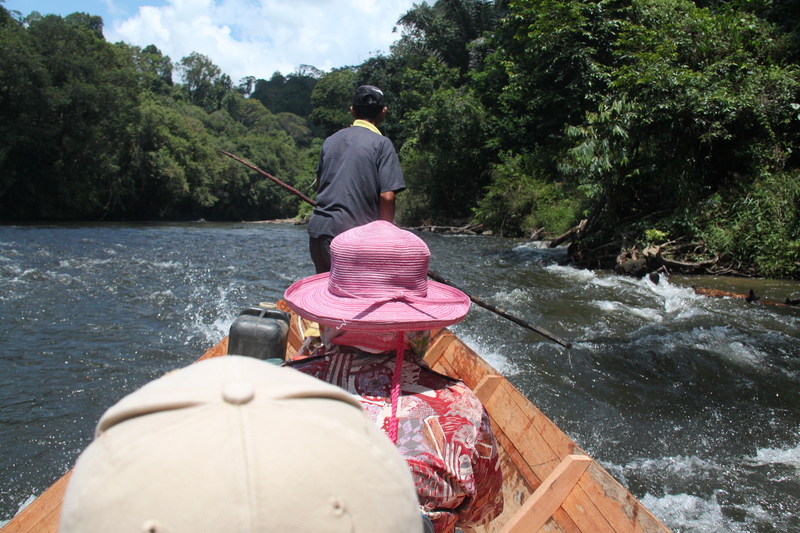 We were welcomed like VIPs, and they said goodbye to us…Punan Bah community’s style. As I looked up from the jetty of Punan Bah on that final day, I shed some tears. Experiences over there is definitely worth remembering. I have been to a few remote places, but here, I want to try to put down some memories I had in Punan Bah. It was during one rainy day. The large living room was dim. All the doors and windows were open. Five women; two in their 50s, and three probably in their 30s or 40s were sitting at one corner of the living room. At the centre among the gathering was a basket of rambutans. The women were talking, eating, and just enjoying the quiet moment. The village chief was out at the moment, meeting some people, maybe having discussion on village matters. 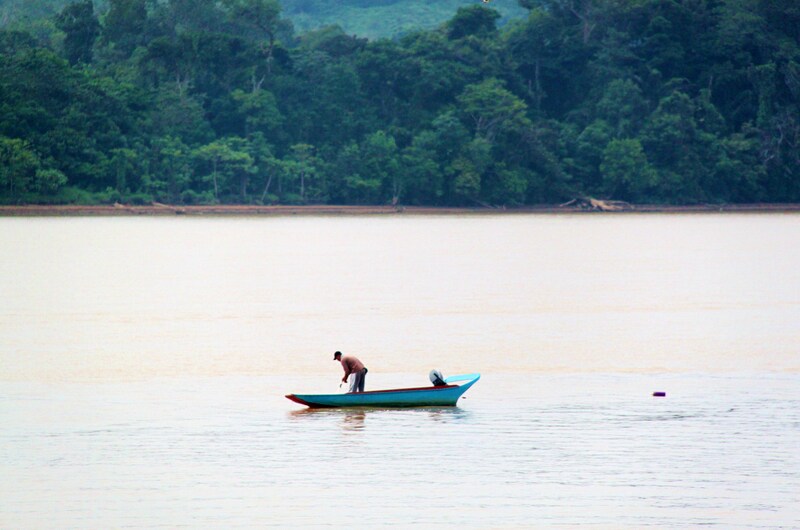 Punan Bah is a quiet place, very peaceful and the people were always smiling. Not many people knew this, but in the middle of it all, the people were trying to rebuild their lives. In 2008, Punan Bah was razed by fire. The midday incident destroyed the largest and the oldest Punan longhouse, along with four 200-year-old burial totem poles. This is a matter of concern for the village. Could they re-build their lives? Will life return to normal for them, will everything be the same? The time was 4.30pm and outside was a heavy downpour. Once in a while, the lightning could be heard. The television was still off, so did the fan. Nobody needed fan at the moment, the place was cool enough. It would be a lazy day for city folks. Too quiet and time passed too slow. I tried to read, but the dark room made it hard to do so. So I stopped reading, and went outside instead. There was no gate, the neighbour was just a few feet away, separated by the dirt path. Their doors were open too, but I could see no one. Lights and entertainment would only start at 6.30pm when the electricity turned on. The village has yet to receive full electricity supply, the place was too remote. For years, they depended on generator for electricity. At 4.30pm, part of the youngsters’ activity was to swim at the river. Or maybe fishing. Today, all decided to stay home. The heavy downpour made the river a dangerous playground. At the far end of one of the houses, few young men were sitting at the verandah, playing guitar, singing, drinking, smoking, and talking. No one worried about social problem here, because there was none. Men showed their most gentleness way and respected women just like they respected other people. Zero crime rate? I couldn’t be sure. Young people were hardly seen at the village these days. With a population of about 1,500, traditionally the folks are farmers. But in recent years, many young people migrated to urban areas for jobs, to escape the rural poverty. There was a kindergarten, a primary school, and a clinic. There was no road, only dirt and concrete path that connects all the buildings in the area. Walking around, the place felt like a big compound than a village. Some women are particularly gifted artists too. There was only one telephone booth near the clinic. It was placed there for emergency use. When there was a feast, women came together to cook. They certainly know how to cook good food. All people in the village would join in the feast too. During festivals, they put aside all problems behind and just had fun. They danced, drink, laugh, and catching up with one another. Sometimes, when they experienced low pressure water supply, they had to get the water from the tank. They walked fro and back a few times to make sure they had enough water for their own family. Men and women alike, they carried that heavy bucket of water to the their home. Because there was no street light, people moved around the village with flashlights at night. At home, cicadas were everywhere around the house. Towns folk like me avoided any ways we can, but there, they catch them, fried, seasoned, and served as night snacks. On a fine day, they could catch one big bowl of cicadas. This is their life, and for city folks, it was both exotic and it was our Shangri-la. We were very impressed with their hospitality, and what was even more impressive was how they live their life. Community of Punan Bah treasured their heritage very well. Their strength was even more impressive. Just like the river, life could be rough at times, and sometimes, calmer. For people in Punan Bah, and other remote areas people, when strong waves becomes too much to handle, they hold on to each other and pull it through together. When life becomes easier, they certainly take the time off better than us. In the midst of struggle, they truly know the meaning of hard work, of simplicity, of embracing the challenge to make sure that their roots will stay forever. I used ‘midst’ instead of ‘despite of’ these people do not put aside their hardship, but accepting hardships as part of their lives. 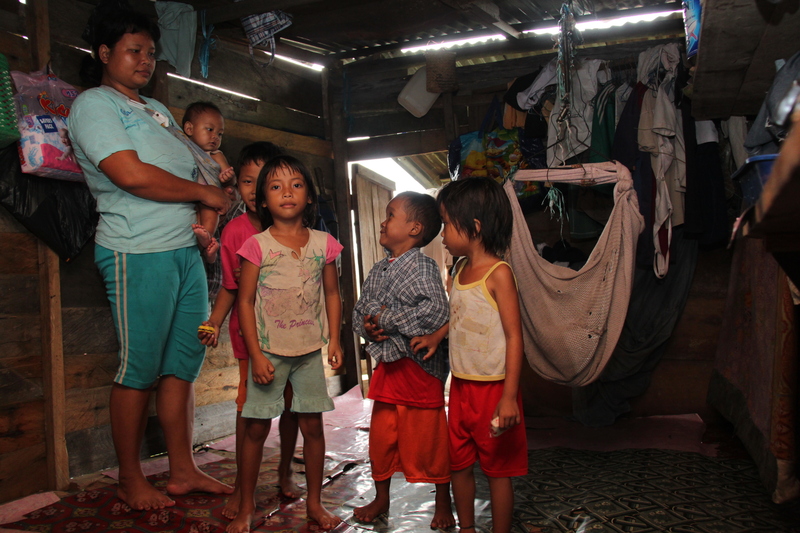 An Iban mother of five children left the comfort of her longhouse and took a five hours boat ride to a school to provide for her children’s education. She would carry a 14 kilogramme of gas cylinder all by herself to the school – a heavy burden that she feels only temporary. She slung a cloth on her shoulder carrying her nine months old baby; she walked through the gravel road and took a boat ride to the school together with her three other children. Going back to the longhouse was definitely out of question, so she built a temporary home, which the local called it ‘Rumah Arau’. The home was smaller than a bedroom, crammed with clothes hanging on across the room, a cooking stove, gas cylinder, pots, bottles, and vegetables were placed at one corner. There was no window and the only ventilation was a small door. The heat was intense inside the room. At night, she burned mosquito coil to keep the mosquito away. However, life isn’t always like this. Life, in fact was easier before. Their difficulties must be heard. But, while waiting patiently for an easier life, they celebrate life, not just in the community, but as an extended family. Not a single day, they ever stop thinking and hoping that the government could do more to help them to catch up with developments. Did you take these pictures? They’re absolutely beautiful! I especially love the last one. Yes i did. Thank you very much. The last picture is actually my favourite too. Hi, I love your voice and the larger idea expressed here! I grew up in a small town 50 miles from the highway! The isolation changes everyone to more of a hive mind, as you can’t be choosy about who your friends are! The longing of a small town, to hold some meaning in your hands, I never forgot that! Thank you for the like! With a large wing, flying far seems a certainty, but rarely is! Nice to meet you! Wow!!! Thanks!!! I’m really glad you like it. Took me quite a while to figure out how to do it. Their lives are so simple, they do not complain much, except more help from the government. I was a little concern that I was unable to present this aspect here. Their life is really beautiful. And no matter where they are, they still hold on to their roots, because it means something to them.